Shawn I think I agree about the zip ties. In the video I was running 1/4" line but when I get the truck back to the house I will run 3/16" line for all of the return lines. I substituted it for the return line to the filter and all the bubbles went right out and it stopped dripping fuel. I was also troubled to not see any fuel flow in the front right return line. It took 10 minutes of idling in park to get any fuel in that line, and it never filled. Are all of those lines supposed to void themselves when the engine is shut off? I don't know if that system is supposed to maintain some sort of pressure or not. I was doing some research and reflecting on the problems I'm having, and I have come up with an another theory. Several of you guys have hit on it, and it relates back to the charging system. I am thinking that I am not getting a charge from the alternator. I will go back in the next couple days during daylight, before the truck gets towed (the notice is already posted on it) and examine the wiring. I replaced the solenoid and the external regulator when I was having hard start issues but could have made a wiring mistake or either could be faulty. This makes at least as much sense to me as a lift pump failure, because when I've had stalling issues followed by no restart I have pulled the batteries to recharge and then had success when they were reinstalled fully charged. I didn't necessarily think this indicated too much because as Bill pointed out a while back, I was having short trips which weren't enough to charge the batteries. I suspect there was no charging at all, and the accessories were drawing down too much possibly leading to insufficient current for FSS? This naturaly happened extremely quickly driving with the headlights on. It makes a lot of sense given that it's been taking 12+ hours on a drip charger to top the batteries off. Any thoughts on my competing theories? Any tests for this i might not be tracking? I've read elsewhere that without the ignition on a good starter relay shouldn't spark when you jump the posts. Is that correct? Are there any issues with running a cable directly from the alternator to the battery instead of using a fuseable link and the solenoid as intermediaries? Anyone have good walk throughs for checking the regulaor? When I get this thing back to the driveway I would love to have a clear way ahead. Batteries will be at 12.3-12.7 volts sitting with a fresh charge, running with a non functioning alternator would probably be closer to 12.0. If an alternator was working you would see 13.0 to 13.6. A multimeter is really all you need to tell if an alternator is working. You can check for full alternator output with just a paper clip if you know the terminals. Otherwise, remove the terminal plug, find the "F" terminal on the alternator, run a little jumper wire from a battery positive terminal directly to the field terminal. Direct battery current to the fields forces the alternator to put out its maximum voltage at any RPM. If voltage stays around 12V you've probably got a shot diode or worn brushes. I got the truck home but it took two separate trips. She still doesn't want to start without that tiny spritz of ether. I've been swamped with work and family obligations lately. Luckily my truck isn't my daily driver since I haven't gotten much time under the hood. I checked the alternator output at the batteries and it is 13.4-13.7. Today I started changing out return lines with some clear/yellow line that's fuel rated and got about halfway through. Front 2 on both sides, line from the front PS to the filter, and the line from the hard line to the IP on the DS. Started the truck and let it run for 5 minutes, venting at the schrader valve to get air out. There were a few bubbles in the front PS but they worked their way out in short order. Once she warmed up I did a fuel flow measurement at the schrader valve and got 1 pint in 20 seconds. Let it idle for 30 minutes in the driveway and it ran great. I switched between the front and rear tanks, both ran normally. However, I never got any fuel in the DS return lines... none. 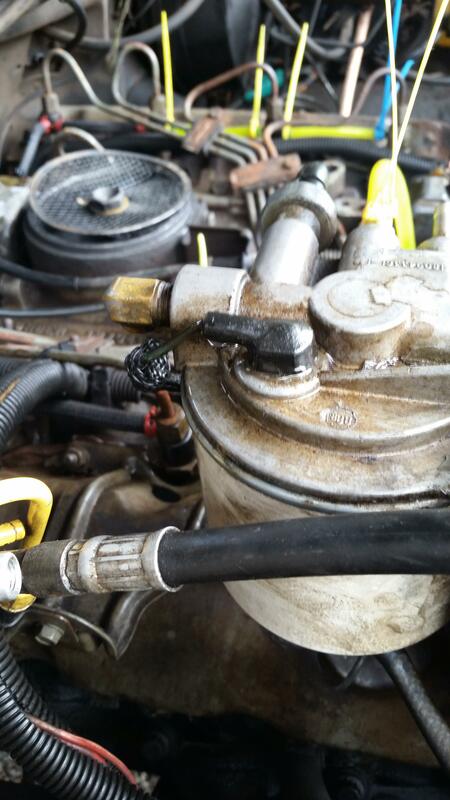 I know those cylinders are running and injectors are getting fuel, as the last time I was working on the truck I cracked those lines and they sprayed fuel and shut off, starting back up when tightened down. Is the lack of fuel in those lines an indicator of something? There was fuel in the line to the IP with no bubbles. 1) The dying has only happened while the truck is on the road, usually but not exclusively in low RPM. I'm going to continue to switch out for clear lines, but I'm still not sure if I've got an air intrusion or fuel flow problem. Very frustrating considering when I bought the truck I drove it 4 hours home with only a bit of hard starting. 2) Is there a simple answer for why it will run in the driveway but sometimes only 5 minutes on the road? Could it be that vibrations/bumping are jarring something loose? Is there a place that's a most likely culprit? I'm thinking it could be something as simple as the FSS blade coming loose on the terminal just long enough to shut off or such. If it were a leak between the tank and lift pump wouldn't I see the fuel leaking? This may mean nothing, but after running the truck for a while, there's a vacuum in the tank when I open the cap on the tank. Does that mean the system up to the pump is tight? 3) What is the deal with lack of fuel in the DS return lines? The ones on the PS fill up fine. 4) As I look to tighten the fuel system, what kind of fittings are guys using to switch over to a rubber line instead of the hard line that's fit to it from the factory? 5) What the heck kind of fitting is on the fuel heater? I want to do the NPT plug on it but I couldn't even get the darn thing off to get a look at it. Anybody have a good walkthrough on this? This is the only place I've got a visible leak. Thanks as always for the wisdom folks. This may mean nothing, but after running the truck for a while, there's a vacuum in the tank when I open the cap on the tank. Does that mean the system up to the pump is tight? That could be your problem, good catch! Any tank has to be vented one method or another. On my '91 both tank caps have a one way check valve in them. Years ago a time or two I've come across a tank with a nonvented aftermarket cap and there was enough suction to partially collapse the tank. "What the heck kind of fitting is on the fuel heater? I want to do the NPT plug on it but I couldn't even get the darn thing off to get a look at it. Anybody have a good walkthrough on this? This is the only place I've got a visible leak." That terminal just pops off, for some reason mine was hard to pry off too. Then the heater assembly unscrews from the bottom of the filter head. It will have either leaking O-rings or the plastic terminal itself is cracked and leaking. Last edited by LMJD; 02-21-2016 at 07:04 PM. The plastic fitting itself (that takes the O-rings) in my case was cracked. Without checking I figured it was a Ford-only part and since I needed it quick, my local friendly Ford dealer charged me something like $120. It was in a FoMoCo box, but was wrapped in an IH wrapper with an IH part number on the wrapper. For the heck of it later I phoned an International truck dealer about price and availability, $60 from IH, live and learn.
" I was looking at my tanks while running and there was no deformation but it could be the vacuum just gets too strong for the lift pump I guess"
Right, those transfer pumps only put out 4-6 psi pressure. Doesn't matter but FYI, the deformed tanks weren't on IDI Ford pickups. I've been suspicious of the Ford v. IH supply of specialty parts, but that's good evidence, thank you. I've ordered two pressure vented diesel caps from rock auto and they should come in this week. From my research i think these are vented. Seems like this may be correcting some shortage/fault in the duel fuel tube system, but i don't figure that's too important, am I right? Also would this address my question about no fuel in the return lines on the DS? Just wondering where else I should focus my time on the fuel system really. I only get a couple hours a weekend usually. I'm still wondering about the lack of fuel in my DS return lines. Could this be from the vacuum in the tank draining those lines extremely quickly or is this a symptom of something else? The new caps should be in today when I get home from work, but I'm curious if anyone has seen this on their trucks. Caps and lines are new and tight. I'm starting to suspect that I have multiple, separate issues. Looking back over the recent issues with the truck dying on the road, the vacuum in the gas tank due to lack of ventilation made a lot of sense (LMJD, thanks for that). The trips between stalls seemed to get shorter and shorter, until I left the truck sitting for several days in which time I'm sure the pressure normalized some. The new vented caps came in so since the truck was running low on fuel anyway, I decided to take a test drive up to the nearest gas station which is 8 miles away. The truck started up with the tiny spritz of ether (I know I still have air intrusion since I haven't gotten my hands on the parts to get after the fuel heater) and then it drove pretty great all the way to the gas station. Ran it on both tanks, but mostly the back one. No problems with stalling and the power seemed normal. So I topped off both tanks and went to start her back up. Now recently I've had no issues restarting the truck after it's warm, but this time I turned the key and absolutely nothing happened. Keep in mind the truck had just been running literally 4 minutes earlier with no issues. I attempted to jump the solenoid with the key in run, and got nothing. So I ran a wire from the negative post of the battery to the small center post of the solenoid. It clicked when I did, but then did nothing when I attempted to jump the solenoid while it had power. The starter didn't turn, nothing. Checked all of the connections to ground, etc and nothing was loose. I brought the batteries back to the house and checked them, since I hadn't brought my multimeter to the gas station. They both have 12.6v. So now I expect that I've fixed the fuel tank ventilation issue, but discovered another. How does one properly diagnose an ignition issue in the column? Radio and accessories weren't even receiving proper power. I thought I heard the speakers try and turn on in the truck but nothing else was coming alive in the dash. I've never torn one of these things apart, but I am planning to go back to the truck in the morning with all my tools. Parts stores open pretty early, so I'm open to all suggestions. Jumping using the negative terminal of the battery won't do anything. That's a relay on the fender; the solenoid is on the starter. The way to test the ignition switch and "upstream" components is to put a voltmeter on the small wire at the relay and measure voltage while someone is holding the key in the START position. Do you hear a click, either a loud CLICK or a not-so-loud Click, when you turn the key to START? Automatic or manual transmission? Did you try ALL key-dependent accessories (turn signals, wipers, reverse lights, etc.)? Automatic transmission. I was hearing no click yesterday, but might not have been paying close enough attention. I took the batteries to the truck this morning. Hooked them back up and turned the key to run. Got the wts light, GPs cycled normally, turned the key to start and got nothing. Then I went under the hood, used a wrote to jump the starter solenoids on the fender and it cranked up. Drove it back to the house with no problems. Started it a couple more times today, used it to pull a couple small stumps, had the normal hard start if it sat for a couple hours but other than that, no issues. So I can't trust this thing any further than I can push it at this point. I'm wondering if I hand an ignition switch or electrical issue and should be trying to trace it. Could this be as simple as a new ignition cylinder or switch? If so, had that been causing my stalling/shut off or did the gas cap fix that? I don't want to just throw parts and time at it, learned my lesson there. If you guys know of old threads or other resources to point me to I'm all ears. I'm an admittedly amateur home mechanic, but I'm trying to learn as much as possible. Thanks s always for your time. fuel filter or the seal at the filter or even maybe a low pressure lift pump starting to go bad. Which terminals on the relay did you jump? Try starting it in Neutral. If that doesn't work, try holding the key in the START position with one hand, and moving the shifter from Neutral toward Reverse and toward Drive with the other. If it catches while you're doing that, then the neutral safety switch is the prime suspect. Another jumper test to try - put a jumper wire from the battery positive to the small terminal on the relay. If it cranks, then the relay is good, and the problem is either the NSS, the igniton switch (or cylinder / actuator), or the associated wiring. If it doesn't crank, the relay is the prime suspect. Best resource, along with reading this and the other forum sites, is a set of factory service manuals. Have you looked into the neutral safety switch? This was an issue in mine along with a pin hole in the fuel line. SO if I where you I'd start with the cable connector in the engine compartment, and neutral safety switch. Hard starting issue I'd look for fuel line pin holes going to the lift pump, then for air leaks on the return lines to fix air intrusion and fuel drain back. All so check the glow plugs too.